What happens when Hy-Line and Ben & Jerry’s want to make sure that you have the most deliciously fun summer? An Ice Cream Float! Ben & Jerry’s has two staff members on board who serve up three kinds of ice cream, hot fudge, strawberries, whipped cream and a table full of toppings. Limited live commentary. This one-hour cruise available on Wednesday nights at 7:00 pm from July 10th through August 28th. Details and band schedule coming soon! Learn about the history of Hyannis and local area landmarks including Great Island, the Kennedy Memorial, St. Andrews-by-the-Sea, Squaw Island, Point Gammon Light, and the historic Kennedy Compound in Hyannisport. Live commentary. KIDS RIDE FREE on morning trips all season. The best way to see the memorable sights and beauty of Hyannis is by the sea. Relax and enjoy the views as your guide explains the various points of interest you see along the way. It’s a fascinating (and sometimes comical) history that includes aspects of our maritime industry, the people who established our waterfront community, and some of the area’s most interesting sights. 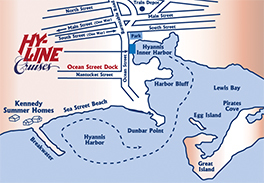 Our departure point, Hyannis Inner Harbor, is bustling with activity – ferries to the islands, fishing charters, and more. The mid-Cape is a great choice for those who want to be centrally located and enjoy a bit of everything the Cape has to offer. It’s an experience that will be one of the highlights of your trip to Cape Cod. Any it only takes an hour. Check out our Aquatic Exploration Cruise with Mass Audubon for something else fun with the whole family!